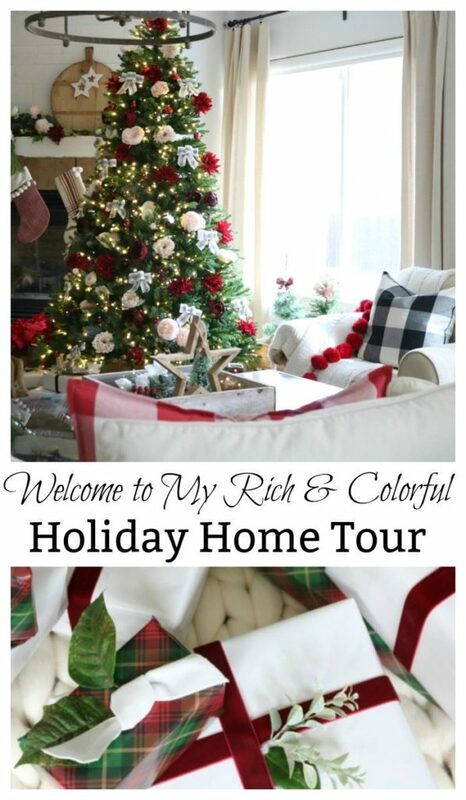 Welcome to my Holiday Home Tour! 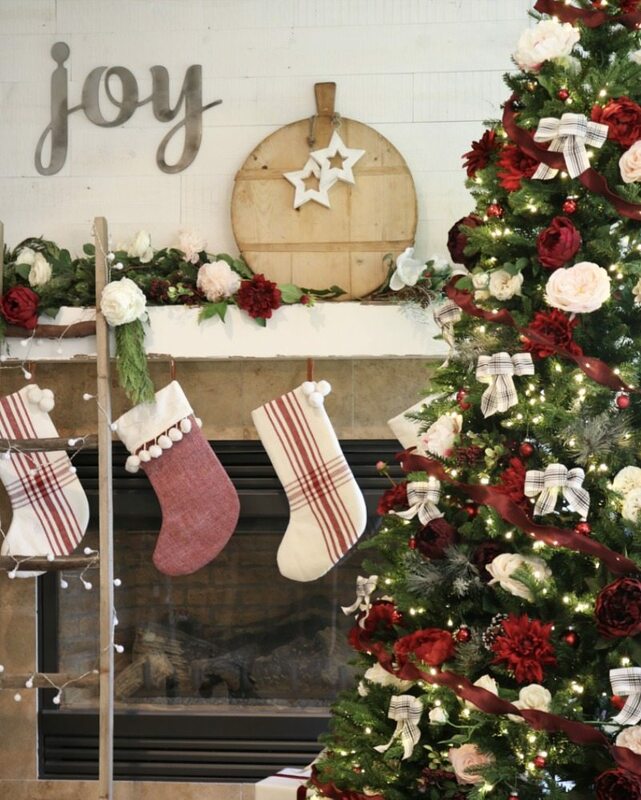 Julie and I look forward to decorating our homes for Christmas all year long. 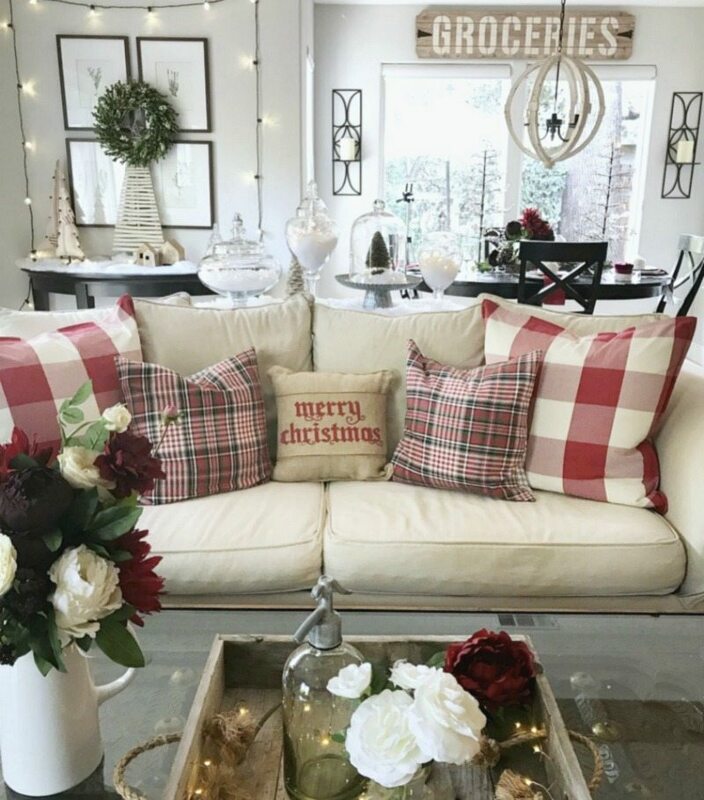 If you’re anything like us, you love to decorate your home for family and friends to enjoy throughout the Holiday Season. 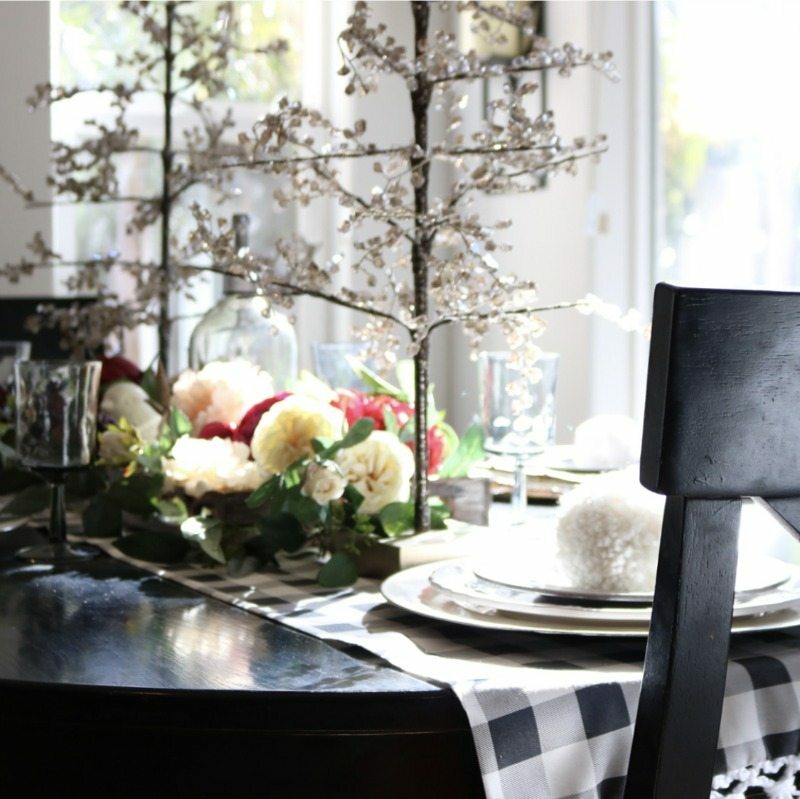 The beauty you create in your home sets the stage for all your festivities. 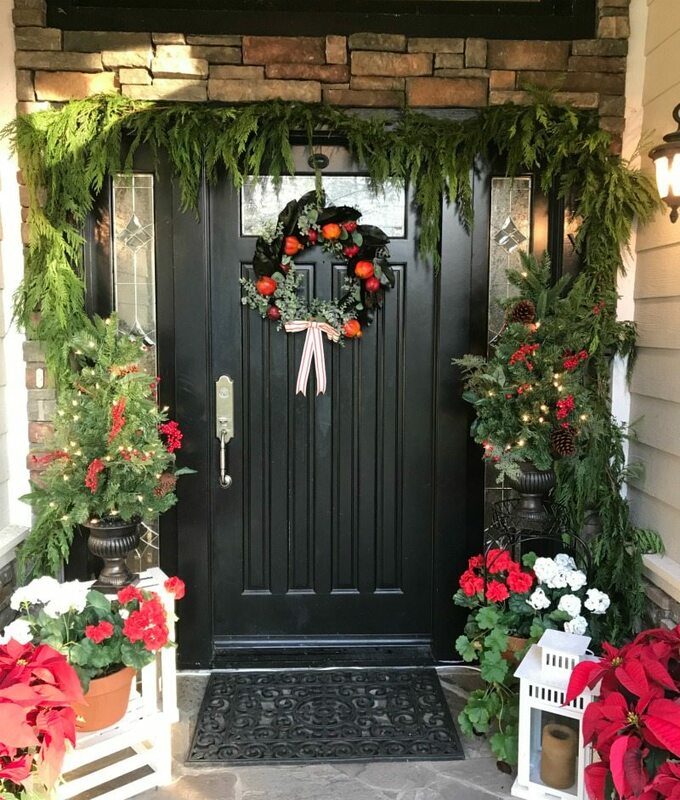 Whether you are just starting your own family traditions or are following generations-old customs, your home is the all-important backdrop to memory-making events that happen throughout the season. 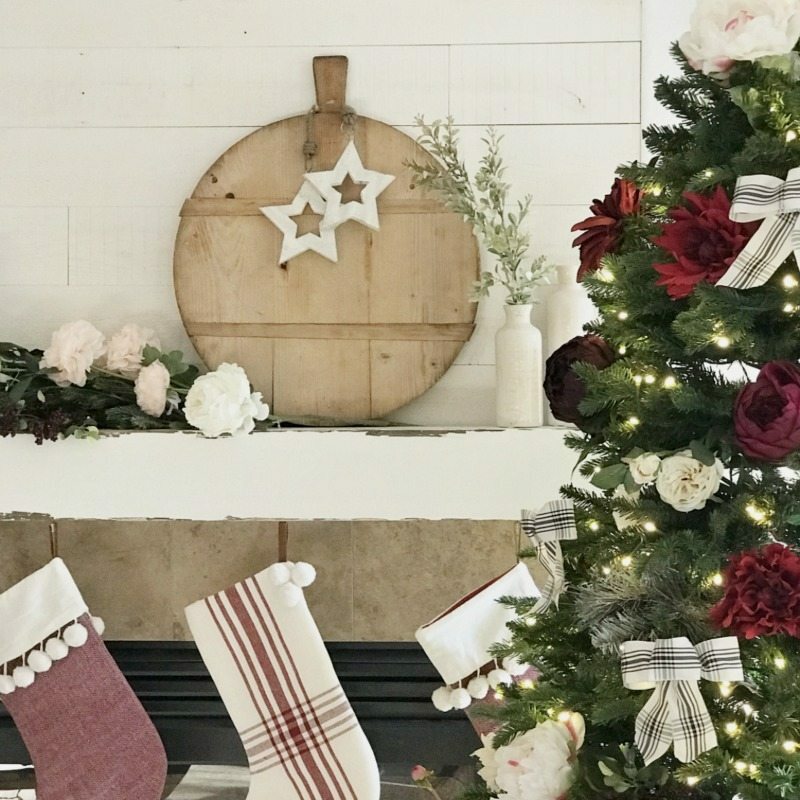 From caroling, cooking baking, tree decorating, wrapping, gift giving, party throwing, we know that the ambiance you provide plays an integral part. This post contains some affiliate shopping links for your convenience. Shopping with us helps support our blog and we are so grateful! If you have arrived from our talented friend Sarah The Belmont Ranch then a special welcome! We know she has your creative juices flowing, so let’s continue that right now! No pressure and no worries! Come along with us and take a tour. 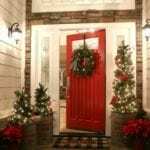 We want to show you our best decorating ideas to help make your holiday home beautiful and inviting. 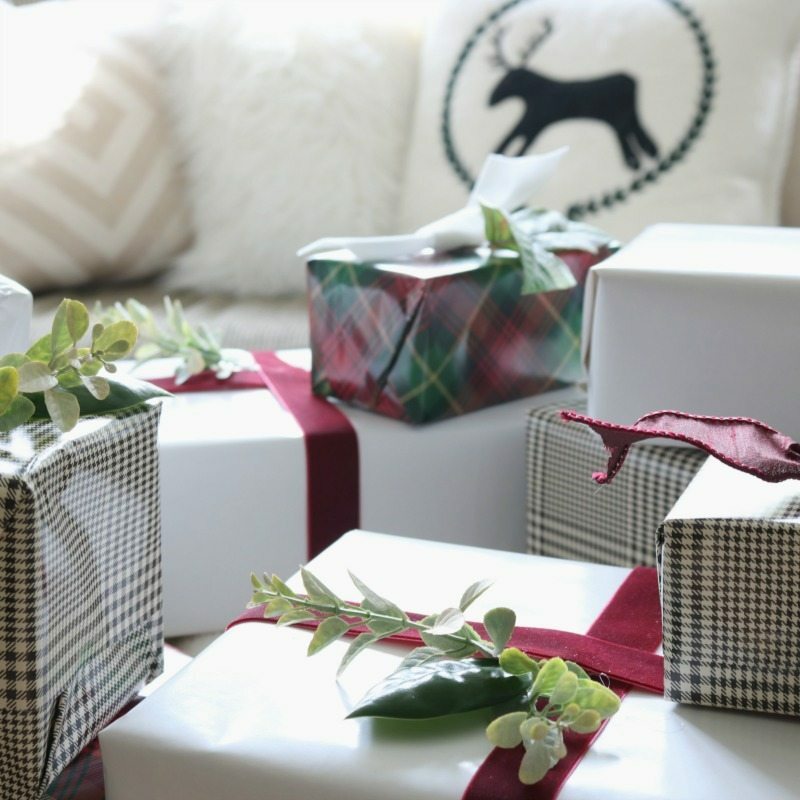 Our budget-friendly, easy tips will have you ready for guests in no time at all. This post contains some of our favorite products and vendors for your shopping convenience. We truly appreciate when you help us support our blog by choosing to shop with us. Fun Side Note: My Holiday Home Tour from last year is currently featured on a 12-page spread in the holiday edition of Cottages and Bungalows magazine. Grab a copy this December and enjoy! Choose your color scheme and stick to it. You can’t go wrong with the colors of the season. Make it “living” with faux or real plants. Frame the door like I did here. 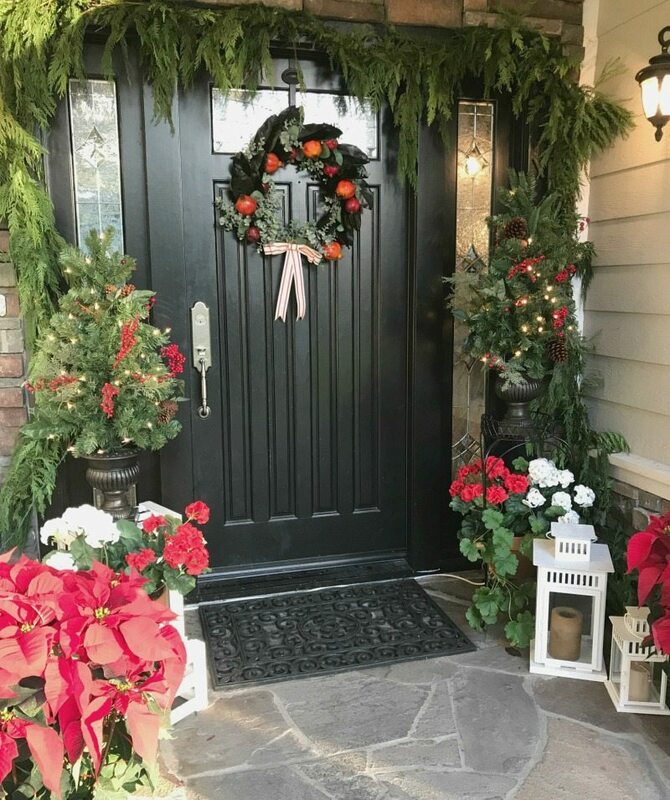 Add some lights so it looks good greeting guests day or night! See? It really is simple when you break it down. I know I’ve told you this before, but stick to a tight budget. And I know many of you do too. Whether you are frugal by choice or necessity it doesn’t matter. Regardless of my circumstances I never like to go overboard on spending. With that said, I love to show how with a few key accessories and creativity you can create MAGIC! Have storage issues? Save space and money by getting in the habit of buying seasonal covers only. An entire stack of pillow covers takes up less room than one extra pillow. This family gallery wall and decorative seating area sits proudly in the center of our home. 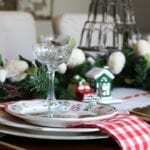 I love swapping items out seasonally to reflect the mood of the moment and to keep things interesting. Once again I achieved fresh appeal without spending a lot. 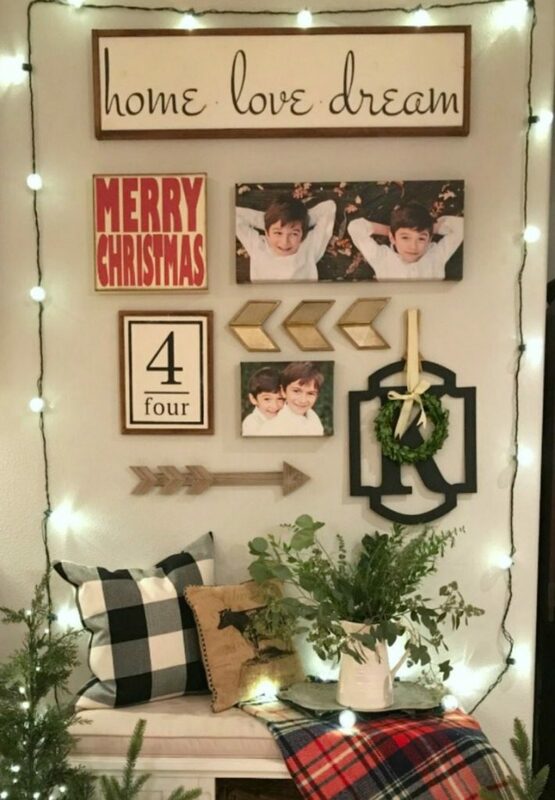 I created a festive “frame” with some retro globe lights (I specifically chose a dark cord so it would contrast with the light walls.) I used what I owned except for the 2 new trees. The two little basket-held trees are Julie’s and my favorite new decor of the year. A staple like these are a great investment as we know they will get reemployed year after year. Shop the trees and lights conveniently below. 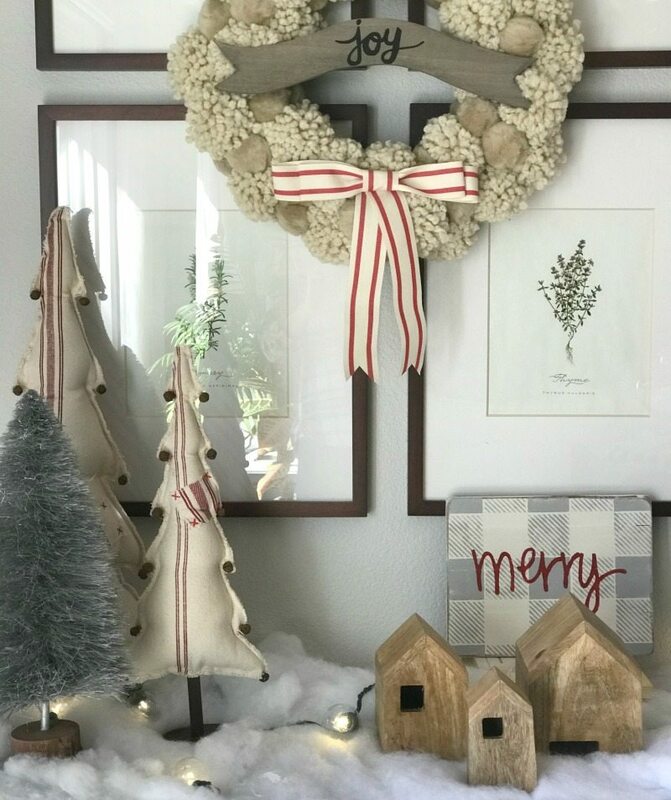 For this vignette it all started with this beautiful wreath from Jessica @the.accidental.farmgirl Wreaths are a huge part of my Christmas decor every year….and when I saw this pompom wreath I knew exactly where it would go! (The wreath is linked in our shop!) Once I had the wreath the rest of the decor just flowed. I chose creams and neutrals with gray accents. And just a touch of red. Done and done! There really are no rules…at least none that matter! Express yourself and care less about what others think…it’s you that matters! 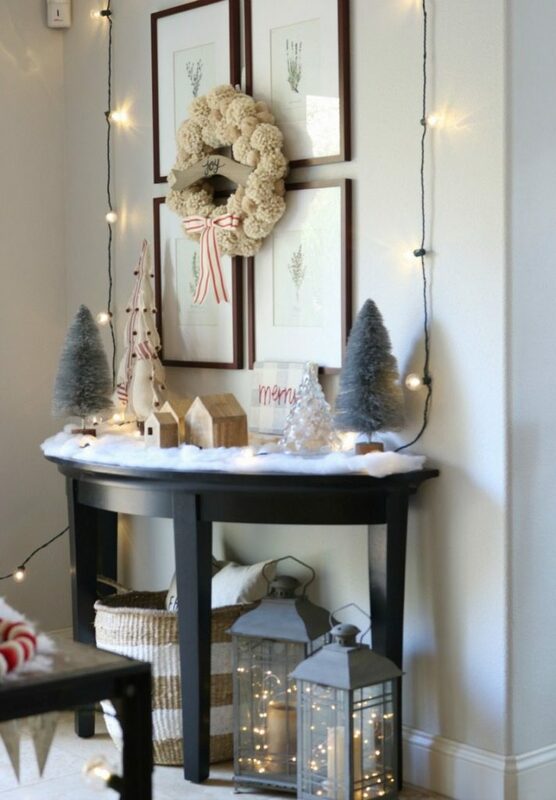 If you’re not having fun decorating…start the list again! I’ll be very honest with you: I’m not much of a planner. I live and decorate organically. In other words, my life is a free for all 🙂 haha! But before the holidays I actually did a fair amount of brainstorming. I wanted to have at least a guiding inspiration before I began decorating. Plus, I had to gather my supplies! 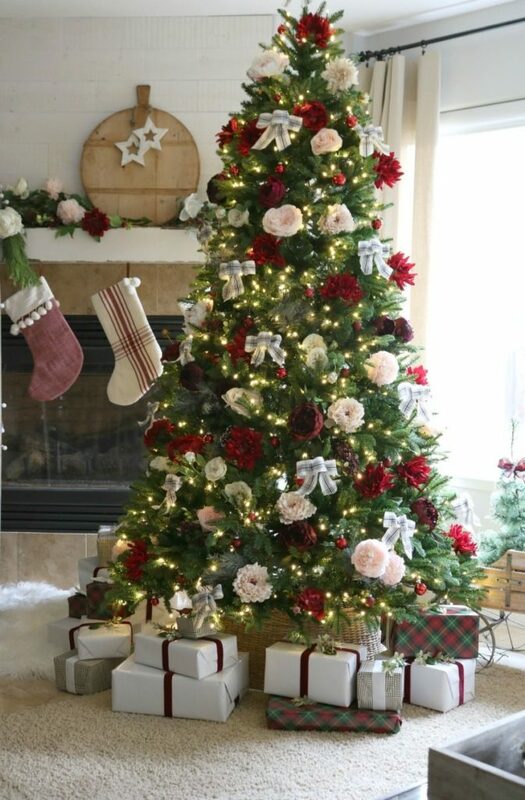 Click Below to shop my King of Christmas tree! 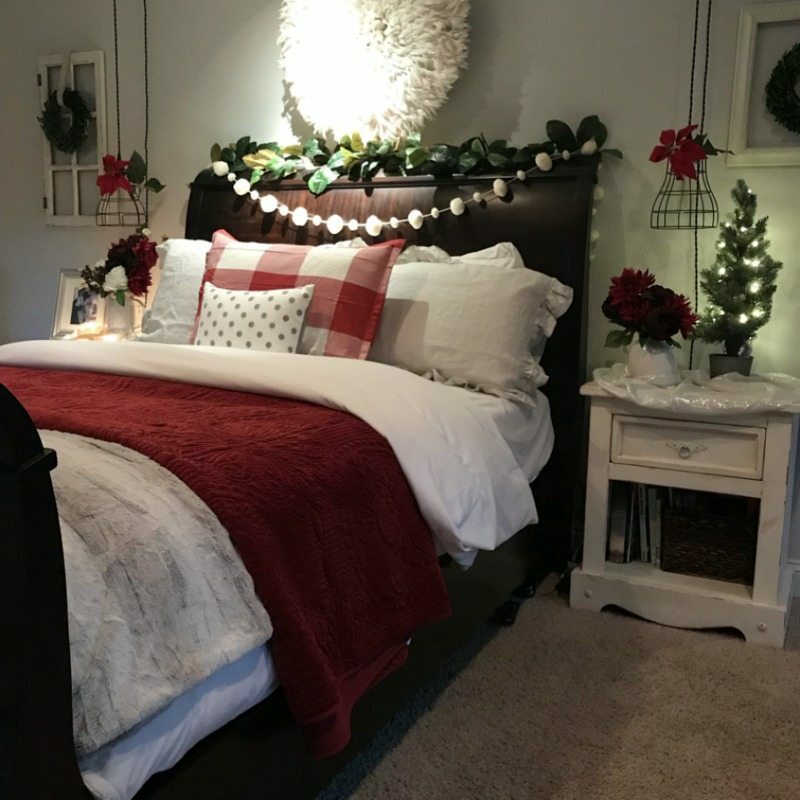 I asked myself what I truly love in decor…and thought, well, besides pillows (and we’ve already been through that) …flowers! I am all about flowers. 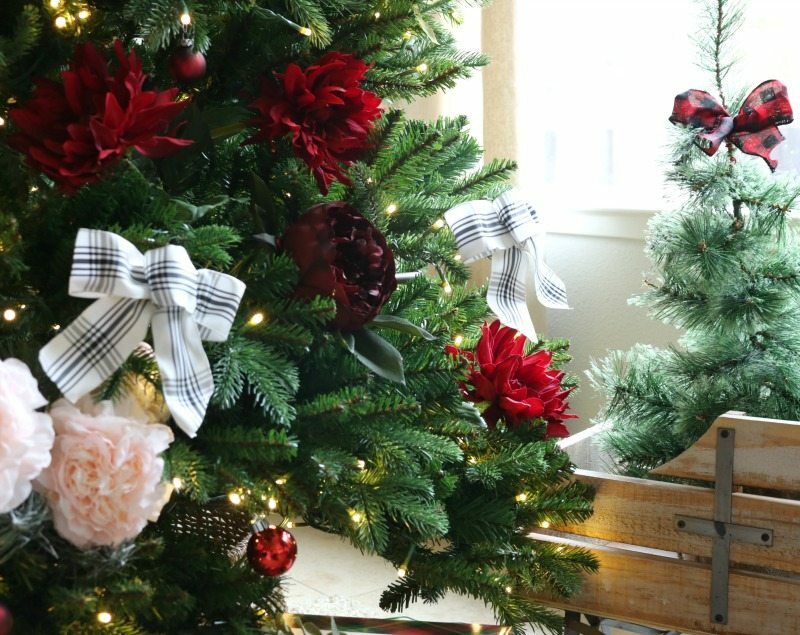 Why not infuse Christmas with florals? In my imagination I could see my beautiful floral tree taking shape! I went straight to Afloral.com to shop! They have an incredible selection of silk flowers that are the most beautiful and most life-like I have ever seen. I selected an assortment of roses, cottage roses, peonies, and dahlias. For my color palette I began to picture rich, bold colors that would create lots of pretty contrasts. I started gathering flowers in deep burgundy, rich plum and mixing different hues of white, cream and soft pinks. The Best Tree Accessory? Presents!! 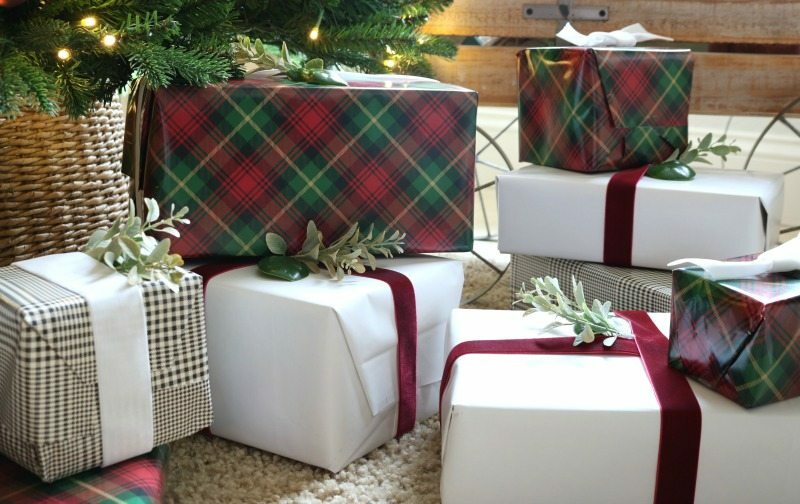 Want to know how to give your tree that extra “je ne sais quoi?” Just add a pile or two of beautifully wrapped presents underneath for the perfect touch! 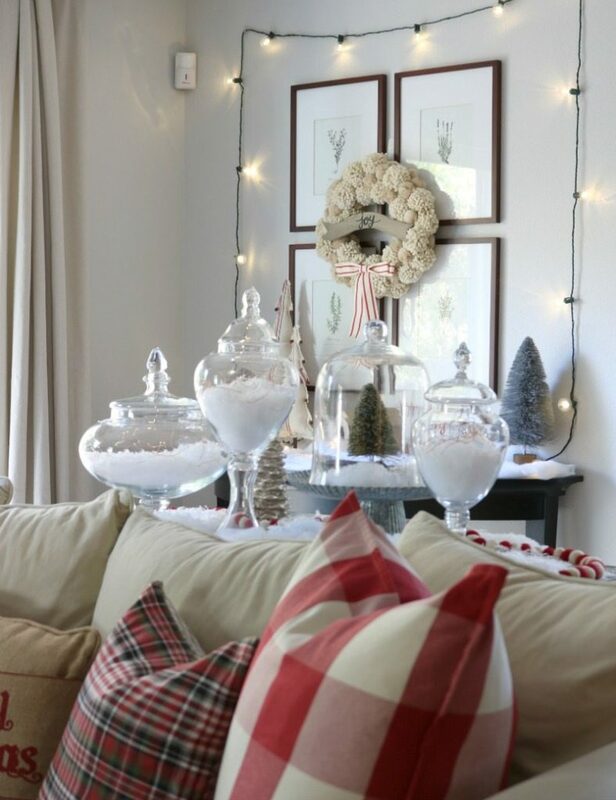 I used a combination of white, traditional red and green plaid, and black & white plaid. I added burgundy velvet ribbon and real & faux greens. Et voila! 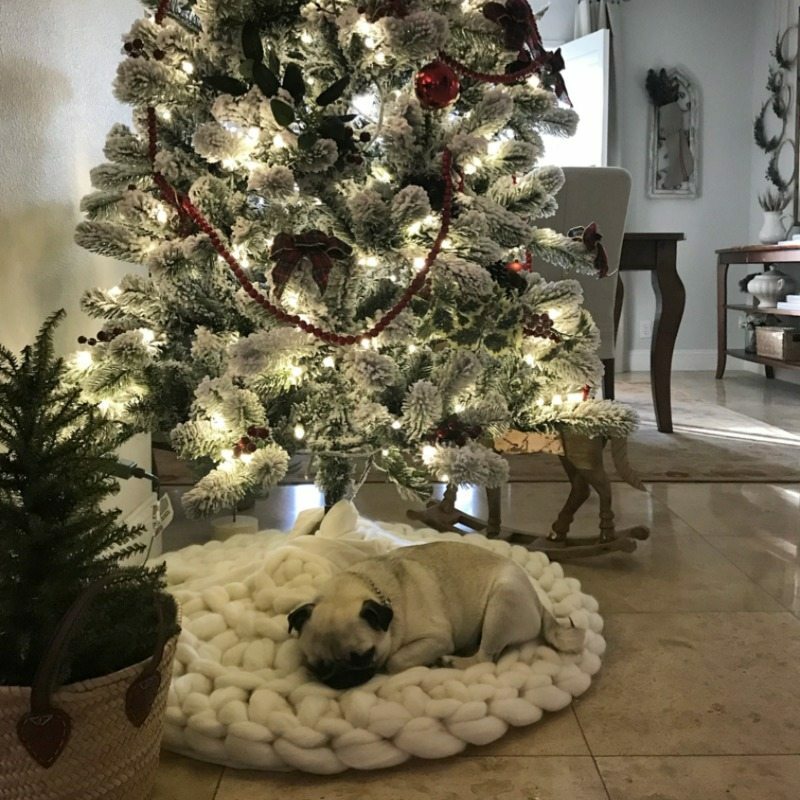 Do you see my natural woven basket tree collar peeking out from under the tree? When Julie visited last year for Christmas she surprised me with it. Not only does it look great, but it reminds me of Julie and her sweet generosity 🙂 Shop the same one below. Puppies Make Great ‘Tree Accessories’ Too! 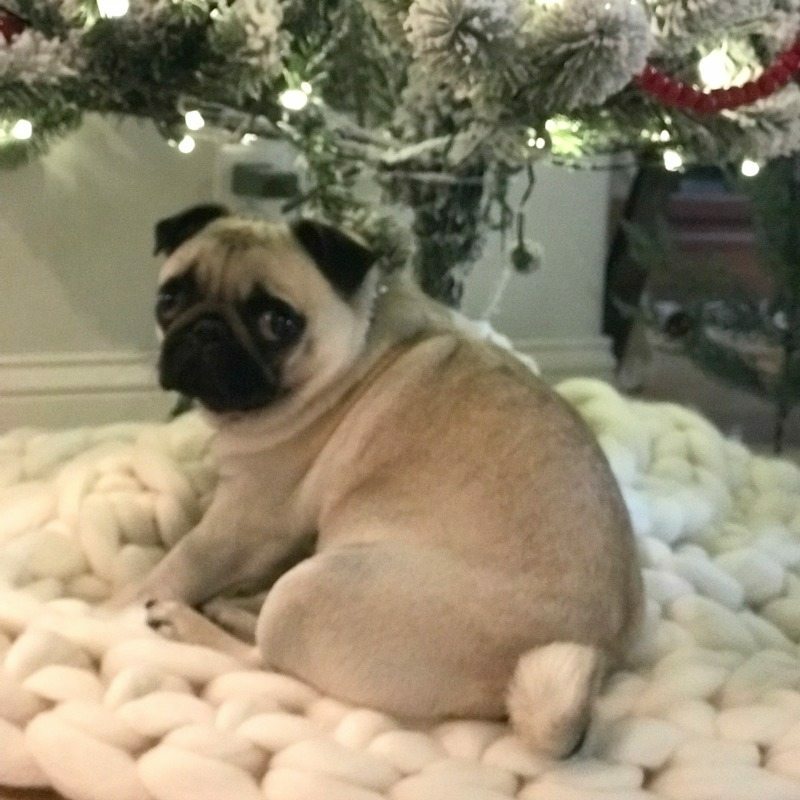 What do you do when your brother brings over his new little pug puppy and she decides to curl up under your Christmas tree?? You take pictures, of course!! Fifi is actually my sister-in-law’s cute little pug! It only took Fifi a few minutes after getting the lay of the land to find the absolutely SOFTEST spot in the whole house! 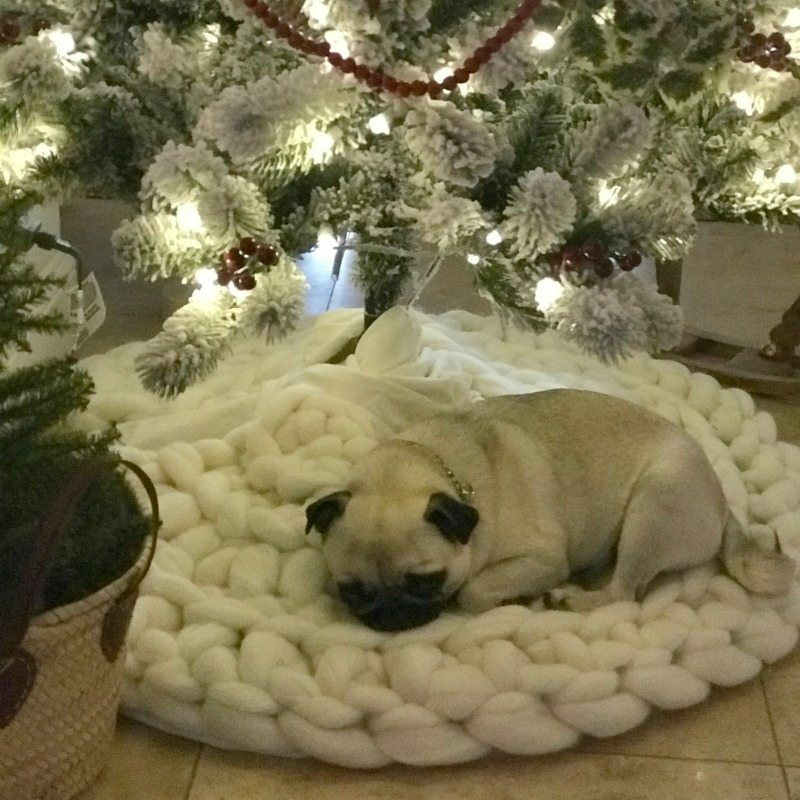 When I found her curled up on my new hand knit chunky knit tree skirt from Becozi I just about died from the cuteness!! Everyone knows that these 100% Merino wool hand knit blankets are super soft and luxurious, but now I understand why they make the best dog beds too! 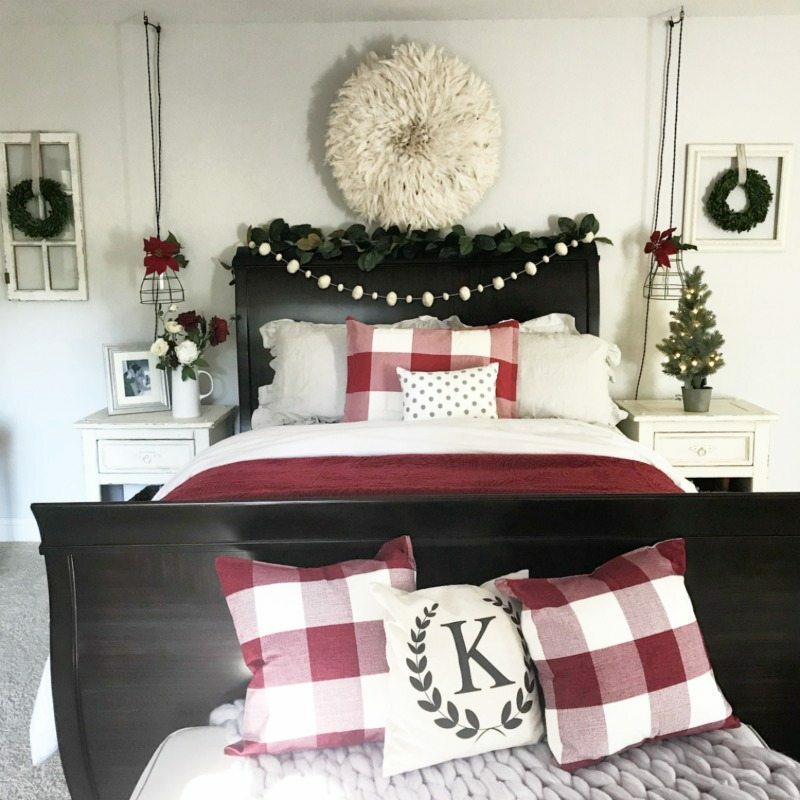 You can shop Becozi’s entire line of chunky knit blankets, throws and products and don’t forget to use our coupon code TWINS10 for 10% off your whole order! And if you are interested in learning how to arm-knit your own be sure to read my Arm-Knitting blog post. I share everything you need to know to arm-knit your first blanket! 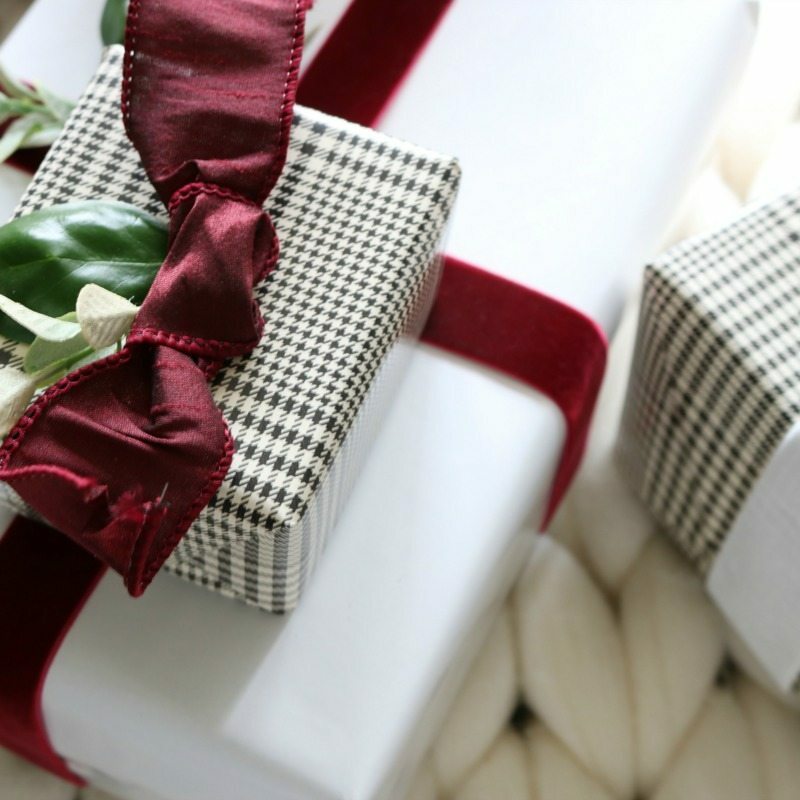 I added little sprigs of greenery to the simple ribbons to complete the package detail. 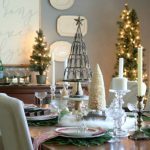 You can use faux or real sprigs, whatever you have on hand. 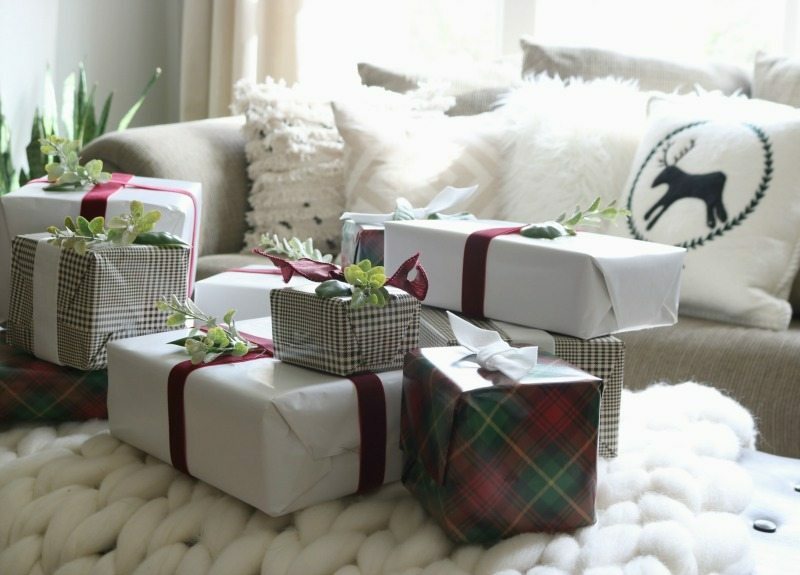 I’ve always loved the look of pine added to Christmas presents. Not only do they look festive but they smell good too! What do you love? 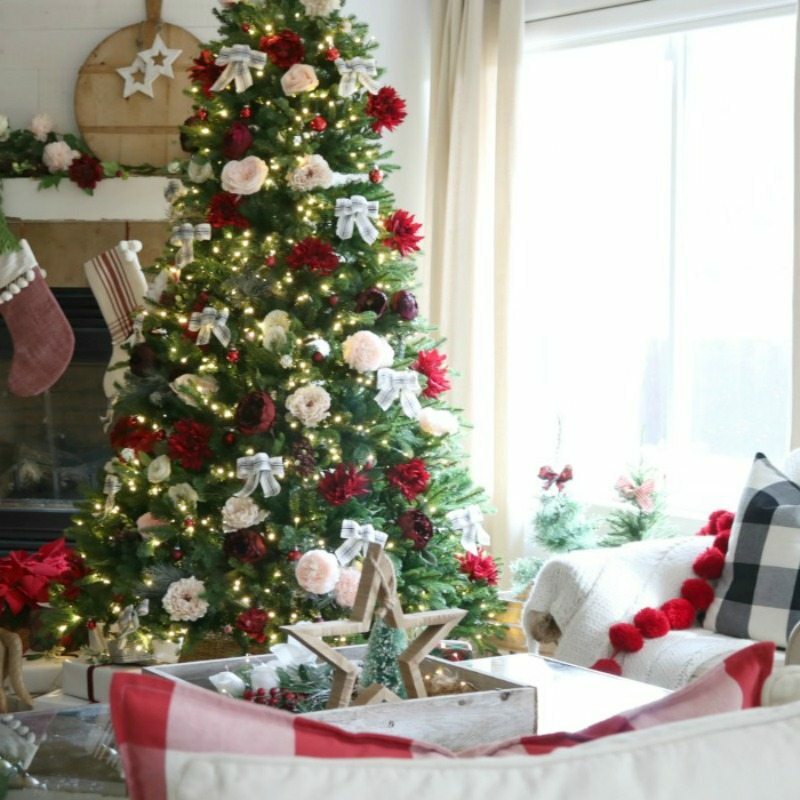 To truly make your tree speak your language make it personal! Is your family musical? Roll up sheets of music tied with bows. Are you a vintage lover? 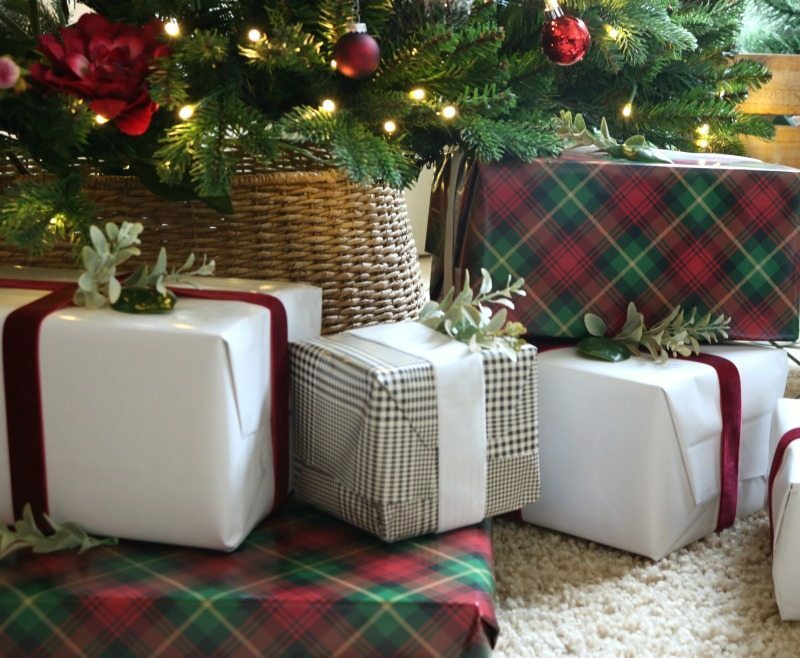 Cover the tree with antique items, not just antique ornaments but your favorite items from around the house. 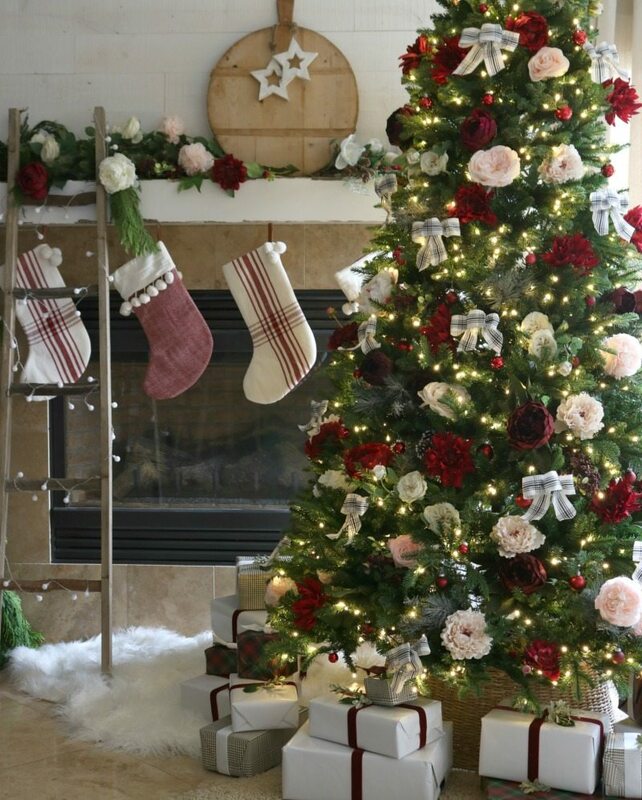 Items too big and heavy for the tree itself you can arrange underneath in fun ways! 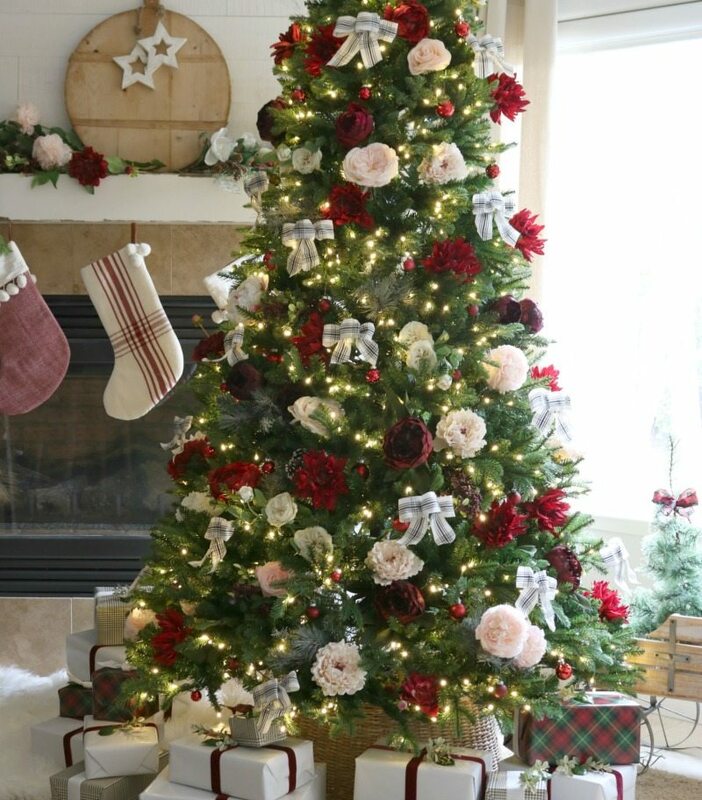 Balance the tree…place items in overlapping diamond-shape patterns all over the tree. When is enough enough? It’s a very personal decision, but we recommend taking your time to decide. 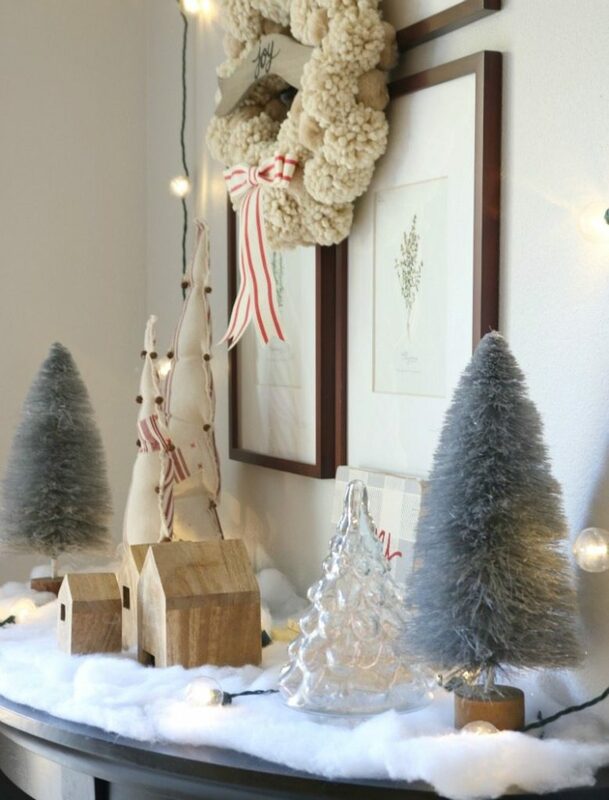 What do I love almost as much as creating fun & festive decor? Sharing it with all of you! 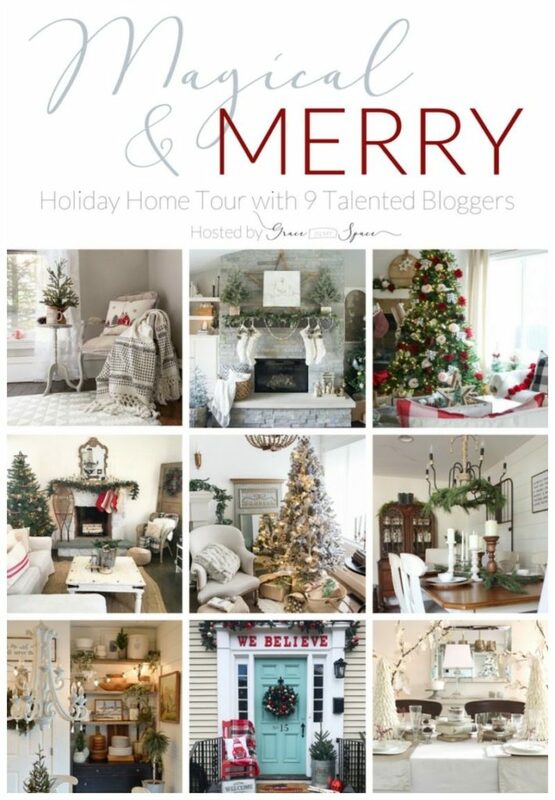 …in hopes that it inspires you to create holiday magic in your own homes! For the next stop on our tour we hope you will have fun visiting our friend Karan Designs by Karan. Enjoy! Happy Holidays, Merry Christmas, Joyeux Noel, Feliz Navidad, Buon Natale! and giving be alive in your hearts this season and throughout the year. With love and blessings for a Wonderful New Year! 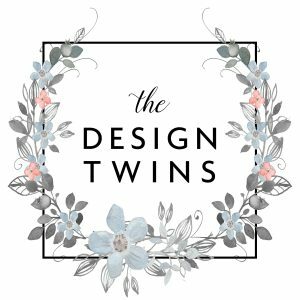 Create a welcoming and inspired Holiday Home with the The Design Twins' fabulous budget-friendly decorating tips and advice! 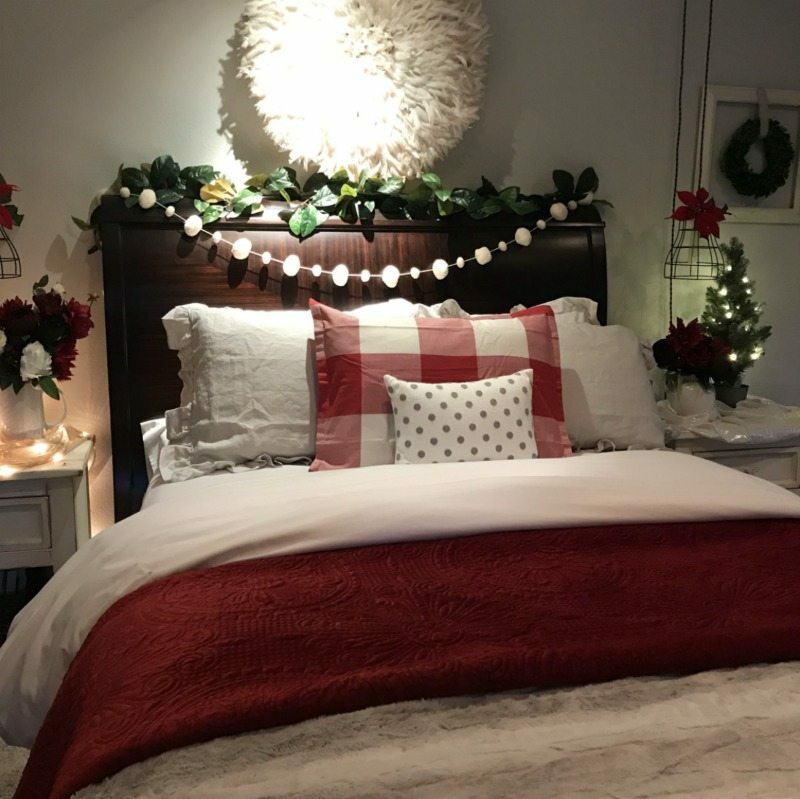 Love your home tour and all of the tips! 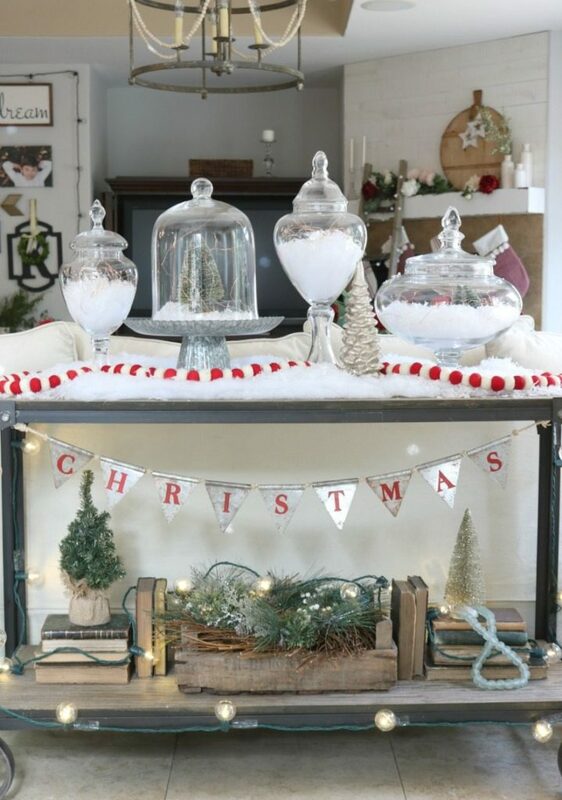 And those glass jars with the snow! ???????? Everything looks simply stunning! Wishing you and yours a blessed Christmas season! Julie and Jodie I am in awe of your gorgeous homes. 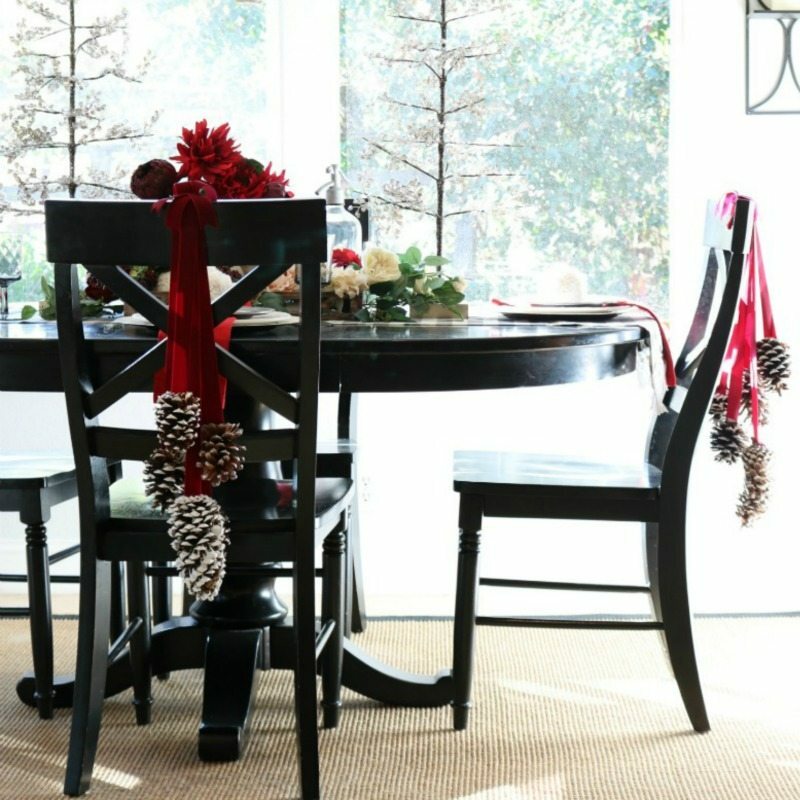 You decorated your homes so beautifully and festive. I couldn’t tear myself away from your stunning photographs. It was truly a treat that I indulged in. from your stunning photographs. It was truly a treat I indulged in. 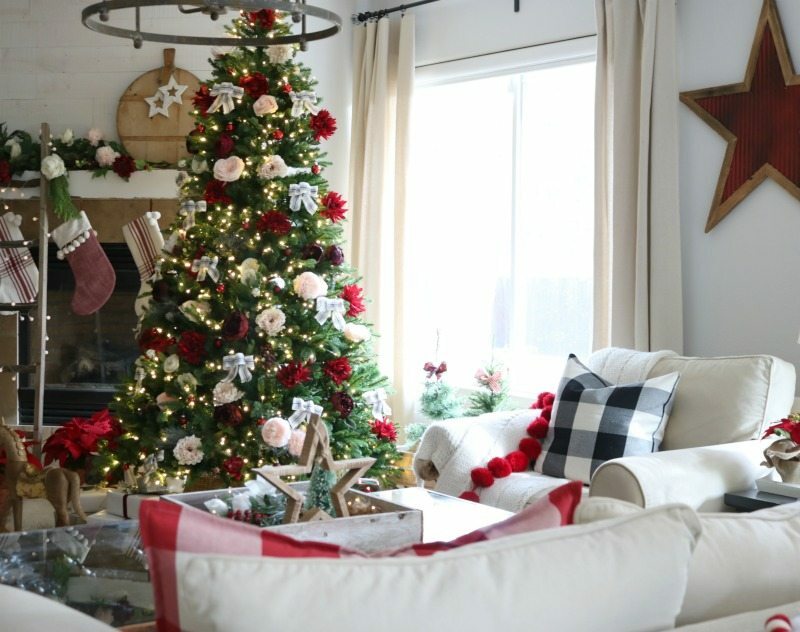 Jodie everything in your home is so festive! I love all the details you added. Thank you for the invite! I loved your home at Christmas ????. Hope you get a little time to relax and enjoy, now!! ???????? 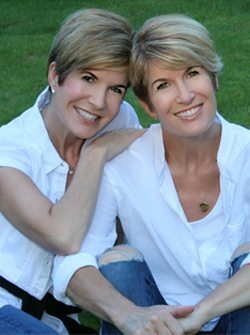 Jodie and Julie, your homes are gorgeous! I loved your tour. 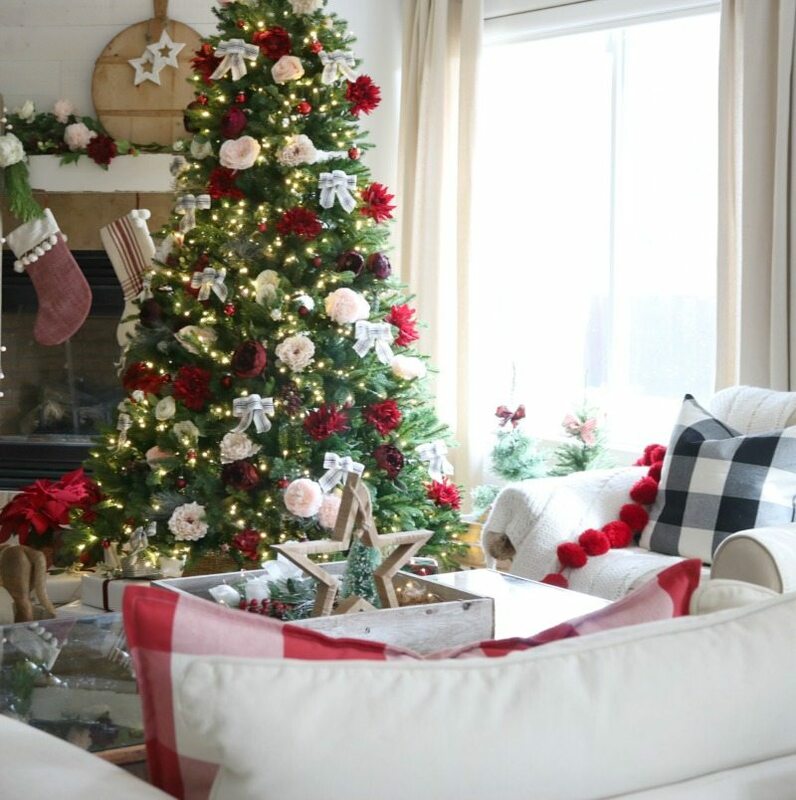 The pops of greenery and your tree is absolutely stunning. So many great ideas and so many lovely pics to look at! It did my heart good to see this today. And thank you for reminding me to use what I have and instill my own personality into my holiday decorations. 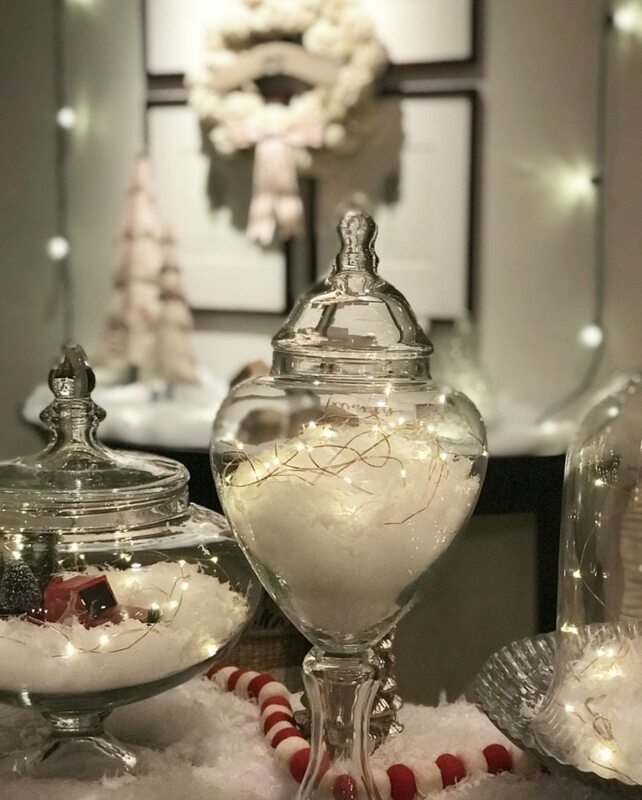 I went to a holiday store yesterday and was stunned at how expensive their items were. 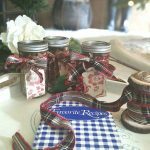 But it helped me realize that I can make some things and re-purpose some items – and that’s fun! So many beautiful ideas! I can’t wait to get to work! Your home is so gorgeous! And congratulations being in Cottages & Bungalows! So well deserved my friend. As always, every detail and space is so very beautiful and inspiring! Love reading your tips and encouragement too! 🙂 Every time I see your homes, I wish I could just pop over for a cup of coffee and take it all in in person. 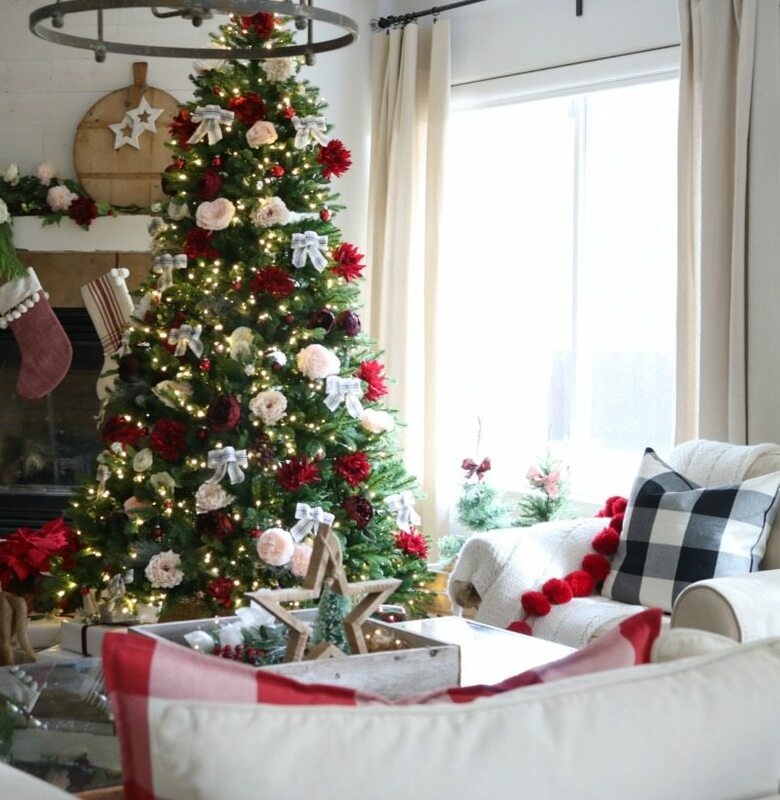 Your homes just exude the joy and magic of the season! !